Stockholm – November 13, 2018 – mi-pad Queenstown, a newly opened property in Queenstown, New Zealand, has bolstered its reputation as the country’s first smart hotel with the implementation of ASSA ABLOY Hospitality Mobile Access. Provided as a feature of the property’s ‘mia’ app, mobile access forms a vital part of mi-pad’s strategy to provide its guests with a next generation hotel stay experience. The integration of ASSA ABLOY Hospitality Mobile Access into mi-pad’s mia app joins other functionalities that guests can control via their personal mobile device. This includes the ability to control thermostat and lighting settings, as well the option to check in or out without having to first visit the front desk. With the nature of hotels being a 24/7 operation, mi-pad seeks to implement services that operate based on a guest’s unique schedule and preferences,” said Stephen Borcoskie at mi-pad Queenstown (www.mipadhotels.com). 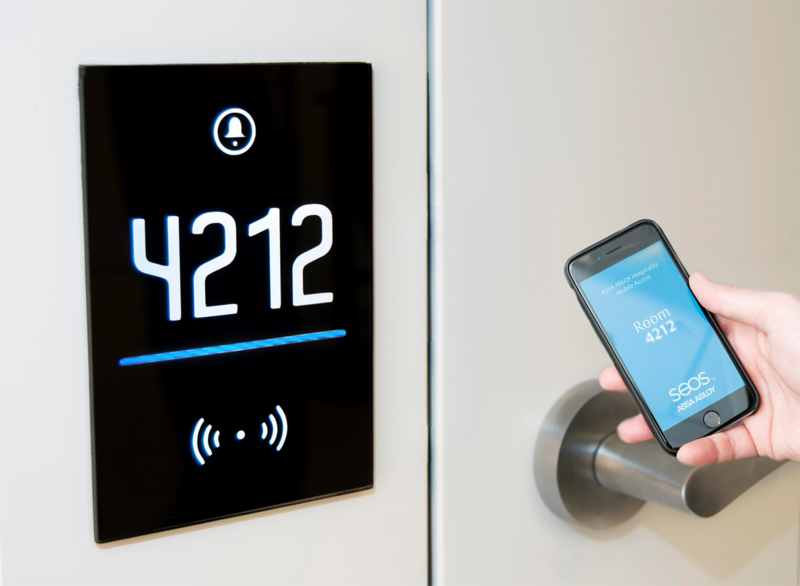 Developed using ASSA ABLOY’s Seos technology, ASSA ABLOY Hospitality Mobile Access leverages advanced encryption technology to safeguard digital key and room number information from data theft and unauthorized access. Once generated, such data is then transmitted to guest devices using a secure communications channel and is then stored inside a digital vault within the hotel’s app. Once a guest presents their device within proximity to the appropriate guestroom lock, digital key information is again transmitted via a secure channel in order to ensure that data is not able to be compromised at any step of the process. The lock eliminates the need for external hardware by providing a sleek and interactive LED panel adjacent to the door. This allows hoteliers to implement a customized panel background with colors and designs that accentuate a property’s unique style and brand. When equipped with an accompanying guestroom-facing touch panel, guests can also post notifications such as “Do Not Disturb” and “Make Up Room” without having to first open the guestroom door. mi-pad Queenstown is a next generation, energy-conscious hotel experience for the smart traveller. The six-storey hotel features 57 stylish and well-appointed rooms and is the ultimate marriage of technology, sustainability, comfort and convenience. The $15m John Blair-designed hotel is in the heart of Queenstown, less than a two-minute walk from the vibrant centre with its hundreds of bars, restaurants and activity operators set on the shores of stunning Lake Wakatipu. MIPAD Holdings is a joint venture project between local Queenstown developer, Lewis Gdanitz, and TJK NZ Ltd, most notably recognized as the owners of luxury boutique hotels, The George, Christchurch and Regent of Rotorua. mi-pad Queenstown is the first hotel for the group and there are already views for expansion, with new sites being identified and intentions to expand over the next 10 years.